Suanny Upegui, Holistic Healer started in the wellness industry 13 years ago. With years of experience in the industry her passion for food, community, ancestral traditions and the power of guidance with compassion and unconditional love to others is the driven force that keeps her sharing knowledge through ceremony and/or personal guidance; Suanny has been certified as a Holistic Nutritionist, Herbalist, Reiki Master, Fitness Trainer and continues her learning journey through indigenous traditions and intensive studies in the power of herbs and various healing modalities. Suanny Upegui was born in the mountains of Colombia, after so much work in her own personal healing process/spiritual growth to understand her powers through love and light , it is clear to her that the path is to tap into ancestral energy, intuitive gifts and magical creations to aid and cultivate higher levels of frequency wherever possible and help as a light in the healing process of others. 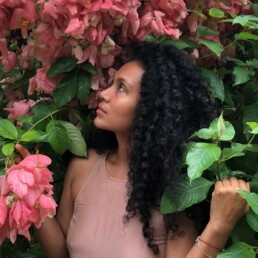 Currently she works with private clients, developing workshops , community herbal farms and consult for business developing medicinal elixir menus.